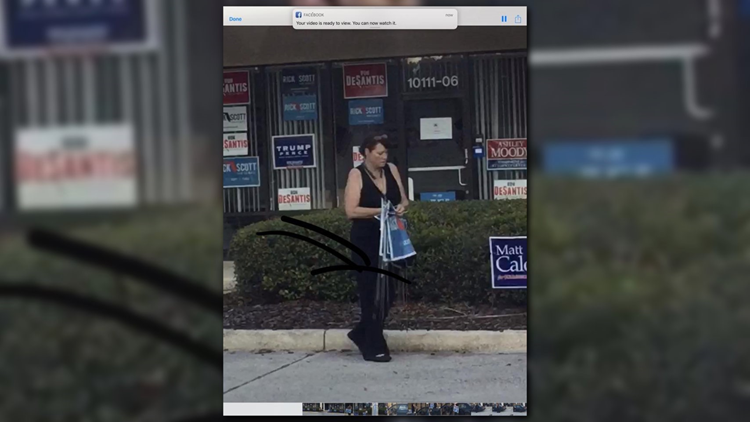 A woman was caught allegedly stealing campaign outside of the GOP headquarters in Jacksonville. A woman was caught allegedly stealing campaign signs outside of the GOP headquarters in Jacksonville. First Coast News knocked on her door to ask her about the incident and she admitted to taking the signs. Mary Dobbins, a special education teacher at Westside High School, says she took the signs by "accident". On Thursday night, Dobbins told First Coast News she thought the signs had been placed illegally. She says she later realized her mistake, called the GOP to explain and then returned the signs. However, the GOP office says no such thing happened. They haven't heard from her and they say they are still missing their signs. A volunteer with the GOP, Karen Morton, said the signs have been going missing since July. Another spokesperson said Dobbins was a "serial sign stealer" but they said they didn't want to pursue charges because they didn't want her to lose her job. Most recently, Morton said, between 15-20 signs were stolen on Saturday from in front of the GOP headquarters located at 10111 San Jose Boulevard. A shopper in the parking lot of the shopping center took the photos of the signs being taken. A police report has been filed and police said that sealing a sign is a misdemeanor but due to the number of signs the cost could be raised to a felony charge, according to Morton. Former Jacksonville City Councilman Doyle Carter says he's also a victim of Dobbins. He says he caught her taking his signs back in August. "She got scared so she started to put them back but she didn’t remember where she got them so she just put them in places," said Doyle. "It’s not fair to the little guy who is trying to get his name out and the supporters trying to support that candidate." Carter said he wouldn't pursue charges either but he never expected her to strike again. When First Coast News returned to Dobbins with more questions, she didn't answer. DCPS has not responded to a request for comment.